Katja Tukiainen (b.1969, Arctopolis, Finland) is visual artist who paints and builds installations. Her primary language is painting and her basic color is pink. With her cute, strong and quick-witted girls, bright oil colors and eloquent brush strokes she talks about serious matters. She paints her slogans to change the world and her dreamy landscapes for anyone to step in. Katja Tukiainen holds Master degrees from both Finnish Academy of Fine Arts and University of Art and Design. At the moment she is working with her Visual Artist's Doctoral Degree in the Academy of Fine Arts, Helsinki. Her artistic research focuses on narrative painting in space. Her paintings are included in many prestigious collections like KIASMA Museum of Contemporary Art collection and Gösta Serlachius Fine Arts Foundation collection. Her works are exhibited internationally since mid 1990. "Katja Tukiainen’s art transcends a recent description of it as a contemporary version of Pop. While the affinity is arguably there, there is a confluence of sources in Tukiainen’s art that distinguishes it from a style half a century old. Tukiainen’s aesthetic is not the only thing that differentiates her work from the past, however; for her narratives set it apart from subject matter often associated with Pop. It may be the diversity of media in Tukiainen’s practice that first and foremost resists categorization; for her corpus is heterogeneous evinced in the numerous genres she works in: painting, work-on-paper, sculpture, video, comics, installation and a mixture of these. Tukiainen’s formal plurality is only equaled by her myriad themes." in English and Finnish, with Riiko Sakkinen's foreword and Katja Tukiainen's Artist's words, full colours & hardcover, 216 pages, text in english & finnish) published by Parvs Publishing. Artikkeli on luettavissa kokonaisuudessaan myös suomenkielellä kirjassa Katja Tukiainen WORKS PART TWO. Kirjassa on Riiko Sakkisen esipuhe ja Katja Tukiaisen taiteilijan sanat. Kirja on nelivärinen, kovakantinen ja 216 sivuinen. Kustantaja on Parvs Publishing. art:21 blog May 18th, 2011. 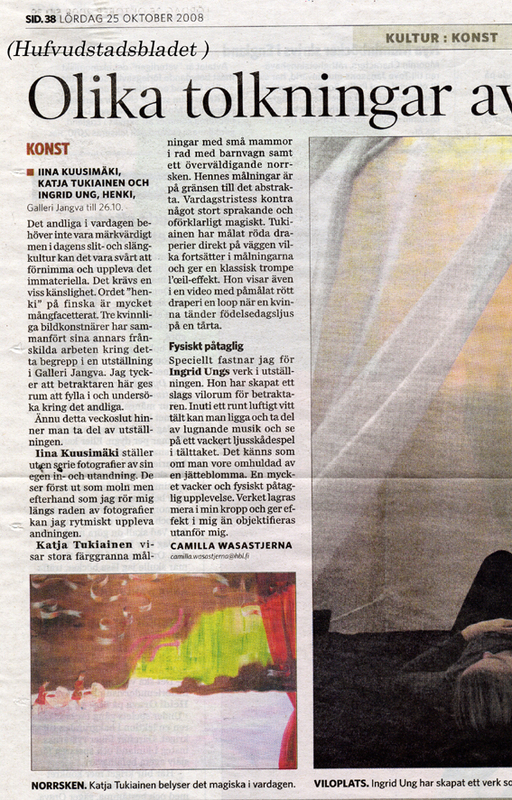 ArtStars*s Nadja Sayej says Katja was cheeky for one moment, July 2010.
art critic in Helsingin Sanomat 14.7.2010 by Veikko Halmetoja. The same in ENGLISH here. 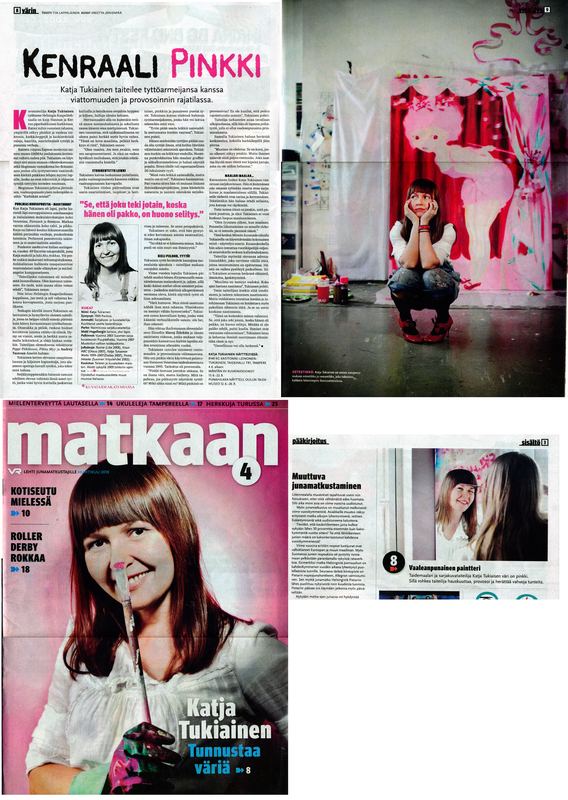 and Katja Tukiainen's Paradis a.
by Tiia Lappalainen in Matkaan magazine (VR, 4-2010). Exhibition Playground (2009) at Skenet.fi. Exhibition Playground (2009) at We Love Helsinki. For Korjaamo Gallery, Katja Tukiainen creates with paintings and wall paintings the exhibition Playground, where the gallery space is transformed into the painting’s playground and stage. Paintings are the actors, formed of brushstrokes, glides and stains of color. Tukiainen’s paintings have the role of an object and narrator, they pose and perform. For the stage, Tukiainen has painted girls and women, lace, red pleated skirts and red military hats. She has painted Karl Marx, an army of girls, cakes, bambis, deers, candy canes, Waikiki Beach, and Nuria and Arnold Schönberg. Her paintings represent and imitate, they portray reality and each other. In her exhibition, Tukiainen lures the viewer’s eyes on a journey from one painting to another by mirroring pairs of images. The eye wanders back and forth between the paintings, from left to right and back again. The mirror-like appearance is however referential. It is an illusion that is conjured up in the mind of the viewer by the expectation of recognizing forms. The exhibition ’Playground’ is part of Katja Tukiainen’s Doctorate in Fine Arts for the Finnish Academy of Fine Arts. Pink. Pink-faced baby deer, pink mountains, pencil-drawn children in winter coats floating on pink ground. Some other colors have their place, especially a pastel shade of green in her arresting landscapes. but mostly pink. Even in “Baga salt pans”, a 2005 painting taken on a trip to Goa on India’s west coast, the salt’s not white but pink, reflecting thick pink sky. So Katja Tukiainen creates a warm world. Her subjects, usually domestic scenes of children, ewoke a sense of both innocence and comfort. While knowing as a cartoomist – she appeared in Comix 2000 and elsewhere, and her husband Matti Hagelberg known for his angular, detailed comics – the Works here on display are paintings, oil on panel and canvas, large and small. Unlike many painters who work in cartoon and childhood imagery, Tukiainen doesn’t do dread. Works opens with her quote: “I want the joy of painting to show.” And it does. She paints children discovering the world around them, or wrapped in contemplation. One leads a worm by a leash and looks at the viewer with wonder and delight. Despite their content, these images avoid cloying in the same way children tend to confound our idealizations. Her subjects are just being themselves, it’s not for our benefit. Her spare canvasses and big-eyed characters recall Yoshitomo Nara. His images of children and dogs have been a minor sensation in hip boutiques from Tokyo to Paris. Takashi Murakami lumps him in with his Superflat movement, but his subjects, genre paintings of cosmopolitan pop, owe as much for Kaz and Sonic Youth. Besides, he’s a painter, not a cartoonist. And Tukiainen goes further than Nara trusting flat fields of abstract color. In this, she owes more to Nara’s peer Hiroshi Sugito. Her stroke and color palette recall his; she borrows his curtains to transform the canvas into something between a stage and a window. In particular, her 2005 painting “One and a half birds on the window sill Hiroshi Sugito” makes the connection explicit, though her maternal birds cheerily discard Sugito’s controlled lines. In the books’s text, critic Timo Valjakka notes the connection, writing that seeing Nara and Sugito’s works while in art school in Venice gave tukiainen #the courage to do what she felt right.” As a “conscious act of provocation, a brazen ‘girlish’ or ‘childish’ protest at the masculinity and heroicity” of the art world, she shares much with nara’s punk children. Clutching knives, they gaze out with defiant, wounded eyes. Faced with them, any number of art critics have thrown up their hands. So they make personal worlds, small archipelagos of meaning where the fragments of a cartoon matter more than the Church of the State. Tukiainen creates a fine image for Micropop in her 1999 series of panels, “A crochet hook,” in which a woman crochets herself a cocoon. But attached to the last string of yarn is a baby. While showing a “minor’ position” it’s also a link to the real world. Tukiainen, despite her name splashed in Japanese across her website, breaks with Micropop’s tendency to otaku solipsism. She draws from life and photos. Her paintings of toys, like the teddy bear in her 2005 work “The birds”, have the heft and texture of the real thing. Even her 2006 series Thousand dollar’s buck (sic) renders the American West more postcard than Blueberry. It’s the remnant of a trip planned but never taken, hardly a retreat into the comforts of a pop cocoon. Her recreation of the trip as a Western just shows her sense of humor. In fact, Tukiainen’s forays into the world – to India, to be precise – have influenced her work as much as anything in pop culture. She’s best known for her travel comics to the subcontinent in the anthology L’Association en Inde and her own book Postia Intiasta. She’s been there at least 10 times since her first visit in 1999, often for longer stays. She finds it “visually very rewarding. It is aggressive, hectic and sensually replete. it is simultaneously difficult and easy, chaotic and utterly peaceful.” And it appears in her work not just in the occasional bindi on the forehead or winter-suited child. Her brushstrokes and use of color share much with Indian vernacular art. In Barry Dawsin’s book Street Art India, he chronicles the kind of murals, advertisements and comic books that tukiainen has no doubt taken in during her travels. A series of paintings from 2002 includes ready-mades, sheets of comic-book instructions for Indian children. "Cute, sweet and lots of pink"
Katja Tukiainen until 30.3. at Gallery Krista Mikkola, (Neitsytpolku 9). Tue-Fri 12-17, la-su 13-16. PICTURES. "Katja Tukiainen (born 1969) is not only a comic artist but also a painter. She is presently undertaking her post-graduate studies in painting at the Finnish Academy of Fine Arts. The both sides of Tukiainen are constantly present and affecting each other. It appears, however, that her painting studies have brought something new into her art. New isn’t the pink though, the colour which Tukiainen quite simply lavishes in her paintings. The painter has now started to slide other colours next to the pink, bright red, delicate green and chick yellow. The themes for the paintings are from a cute and naive kitch world that surrounds a family with children, from old fashioned stickers to a family album. There are bambies, there is a cat grandmother punishing her offspring, there is a bowheaded little red riding hood. Tukiainen’s imagery is very girlie. From one painting to another there are also recurring lace decorated red curtains or masks, behind and in front of which something else can be seen. The red curtains makes the paintings interesting. They are not merely resembling elements but as dividers of space they have also a conceptual and painterly meaning. The back room wall at the gallery is full of cute birds, some alone, some with a friend. The small paintings seem like precision art aimed at this time of year, but it does fit in with the overall view of Tukiainen’s art." "Söpöä, suloista ja paljon pinkkiä"
Katja Tukiainen 30.3. saakka Galleria Krista Mikkolassa, (Neitsytpolku 9). Ti-pe 12-17, la-su 13-16. KUVAT. "Katja Tukiainen (s. 1969) on paitsi sarjakuvataiteilija myös taidemaalari. Parhaillaan hän suorittaa Kuvataideakatemiassa maalauksen jatko-opintojaan. Tukiaisen molemmat puolet kulkevat koko ajan mukana ja vaikuttavat toisiinsa. Näyttää kuitenkin siltä, että maalauksen opinnot ovat tuoneet hänen taiteeseensa jotakin uutta. Uutta ei tosin ole vaaleanpunainen, reilusti sanottuna pinkki, jota Tukiainen suorastaan suoltaa maalauksissaan. Nyt maalari on alkanut liu'uttaa sen rinnalla kankaille myös muita värejä, kirkasta punaista, heleää vihreää ja kananpojan keltaista. Maalausten aiheet ovat lapsiperhettä ympäröivästä suloisen naivista kitsch-maailmasta, kiiltokuvista perhealbumiin. On bambeja, on jälkeläistään pajunkissoin piiskaava kissamummo, on rusettipäinen punahilkka. Tukiaisen kuvasto on kovin tyttömäistä. Maalauksesta toiseen toistuvat myös pitsein somistetut punaiset verhot tai naamiot, joiden takaa ja edestä näkyy jotakin muuta. Punaiset verhot tekevät maalauksista kiinnostavia. Ne eivät ole vain esittäviä elementtejä vaan niillä on tilanjakajina myös käsitteellinen ja maalauksellinen merkitys. Gallerian takahuoneen seinät ovat täynnä söpöjä talitiaisia, milloin yksin, milloin kaverin kanssa. Pienikokoiset maalaukset vaikuttavat tähän vuodenaikaan tähdätyltä täsmätaiteelta, mutta kyllä se Tukiaisen taiteen kokonaiskuvaan sopii." "The joy of painting can be seen and felt"
BOOKS. "It is rare to see a publication which manages to portray an artist’s work as aptly as this one of painter and comic artist Katja Tukiainen, ‘Katja Tukiainen. Works 1999-2007’. 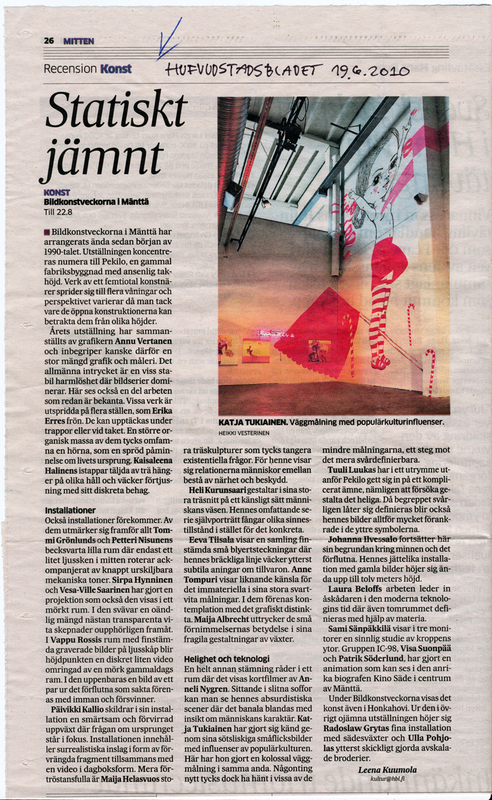 The collaboration with a small publisher ‘Daada’ from Lahti has clearly been intesily fruitful to everyone involved. All the text in the book is printed from the hand written originals of Tukiainen. The cover picture is taken at Tukiainen’s studio and the title of the book is painted on the wall! Marko Turunen and Anne-Mari Hietanen have bound the book in a fun way with care and with heart. The publication concentrates on paintings and is centred around photographs of them. The article written by Timo Valjakka gives fresh views on Tukiainen’s life and work and how they wind together. The text is however beside the photographs, giving them the most space to tell of Tukiainen’s art. The article is printed in three languages, instead of Swedish there’s French. Katja Tukiainen Works 1999-2007 is a fine book with a sympathetic touch and feel which definitely stands out in a positive way from the vast number of contemporary artists publications. The book opens out a lovely pink world, where ‘the joy of painting’ can be seen, as is the wish of the artist herself. However as in the series of paintings connected with femaleness ‘Hospital’ and ‘Croche Hook’ show that behind the pink curtain Tukiainen’s art is not just lighthearted cuteness." Katja Tukiainen. Works 1999–2007. Daada. 112 s. 28 e.
"Maalaamisen riemu näkyy ja tuntuu"
KIRJAT. "Harvoin näkee taiteilijan kädenjälkeä yhtä osuvasti esittelevää julkaisua kuin on taidemaalari ja sarjakuvataiteilija Katja Tukiaisen Katja Tukiainen. Works 1999–2007. Yhteistyö pienen lahtelaisen Daada-kustantamon kanssa on selvästi ollut kaikille osapuolille intensiivisen hedelmällinen. Kaikki julkaisun tekstit on painettu Tukiaisen käsin kirjoittamista originaaleista. Kansikuva on otettu Tukiaisen työhuoneelta, ja kirjan nimi on maalattu työhuoneen seinään! Daadan Marko Turunen ja Anne-Mari Hietanen ovat taittaneet kirjan veikeästi, huolella ja suurella sydämellä. Maalauksiin keskittyvä julkaisu pelaa ennen kaikkea teoskuvilla. Timo Valjakan kirjoittama artikkeli tarjoaa raikkaita näkökulmia Tukiaisen elämään ja tuotantoon, ja siihen, miten ne toisiinsa nivoutuvat. Teksti kuitenkin polveilee kuvien lomassa antaen niille eniten tilaa kertoa Tukiaisen taiteesta. Artikkeli on painettu kolmella kielellä, ruotsin tilalla onkin ranska. Katja Tukiaisen Works 1999–2007 on hieno, sympaattisen oloinen ja tuntuinen kirja, joka varmasti erottuu edukseen nykytaiteen taiteilijajulkaisujen paljoudessa. Teos levittää eteen ihanan, vaaleanpunaisen maailman, jossa "maalaamisen riemu näkyy", kuten taiteilija itse toivoo. Esimerkiksi naiseuteen liittyvät varhaiset maalaussarjat Sairaala ja Virkkuukoukku kuitenkin osoittavat, ettei Tukiaisen taide vaaleanpunaisen verhon takana suinkaan ole yksinomaan kepeää söpöilyä." "The asthetics of the pink"
"Katja Tukiainen, born in 1969, represents precisely the form of contemporary art that I have had difficulties to grasp: expression influenced by comics, and in particular Japanese popular culture which is dominated by annoying colours and large headed, touching, human characters. Making this kind of imagery has been an international trend for some time now, which can strongly be seen also in Finland. And Tukiainen seems to be just the artist who gets me to take hold of that world. It is said of certain things that they are ‘disarming’. The new book which covers widely the production of Katja Tukiainen over the last years, published by Puupäähattu awarded Marko Turunen of Daada-company, is precisely that. I started to look into the book on the tram straight after the publishing event and missed my stop of course – it was that enchanting. Later I started to think of reasons for the power of charm of Tukiainen’s work and came up with at least two, even a little oldfashioned reasons. This ‘neojaponism’ has been marked with a certain impersonality; the imagery is done because it’s done elsewhere too. Tukiainen however approaches things strongly through her own life, and in that way achieves depth and credibility. The other reason is the particularly oldfashioned one: Tukiainen is genuinely a good painter. She manages to transform her pink world into a painting in a very classical way, where the interaction of colour and harmony and breaking of harmony play a key role. Even a middle-aged man has to admit that this book in question is a lovely book." "Vuonna 1969 syntynyt Katja Tukiainen edustaa juuri sellaista nykytaidemuotoa, johon minulla on ollut vaikea saada otetta: sarjakuvasta ja varsinkin japanilaisesta populaarikulttuurista vaikutteita saanutta ilmaisua, jota dominoivat ärsyttävät värit ja isopäiset, liikuttavat ihmishahmot. Tällainen kuvan tekeminen on jo pitkään ollut kansainvälinen trendi, joka näkyy voimakkaasti myös Suomessa. Ja Tukiainen taitaakin olla juuri se taiteilija, joka saa minut tuohon maailmaan tarttumaan. Joistain asioista on tapana sanoa, että ne ovat "aseista riisuvia". Tukiaisen viimeisten vuosien tuotantoa kattavasti kokoava tuore, Puupäähatulla palkitun Marko Turusen Daada-yhtiön kustantama kirja on juuri tällainen. Ryhdyin tutustumaan kirjaan heti julkistamistilaisuuden jälkeen raitiovaunussa, ja ajoinpa sitten tietysti pysäkkini ohi - niin lumoava se oli. Myöhemmin ryhdyin miettimään syitä Tukiaisen teosten lumovoimaan, ja keksin ainakin kaksi vähän vanhanaikaistakin syytä. Tätä neojaponismia on leimannut mielestäni tietty ulkokohtaisuus; tehdään sellaista kuvaa kuin muuallakin tehdään. Tukiainen lähestyy asioita kuitenkin voimakkaasti oman elämänsä kautta, ja saa teoksiinsa sitä kautta syvyyttä ja uskottavuutta. Toinen syy se vasta vanhanaikainen onkin: Tukiainen on oikeasti hyvä maalari. Hänen onnistuu muuntaa pinkki maailmansa maalaukseksi varsin klassisella tavalla, jossa värien vuorovaikutus sekä harmonia ja sen rikkominen näyttelevät vahvaa rooliaan. Keski-ikäisen miehenkin on pakko todeta, että kyseessä on ihana kirja." Katja Tukiainen (s. 1969) valmistuu kaksi kertaa taiteen maisteriksi. Hän valmistui Taideteollisesta korkeakoulusta kuvaamataidon opettajaksi 1996 ja valmistuu Kuvataideakatemiasta taidemaalariksi lähitulevaisuudessa. Tukiainen on myös opiskellut maalausta Venetsiassa vuosina 1994-1995. Tällä hetkellä taiteilija asuu ja työskentelee Helsingissä. Tukiaisen taidetta on ollut laajalti esillä lukuisissa yksityis- ja ryhmänäyttelyissä sekä Suomessa että muissa Euroopan maissa. Hänen teoksiaan on hankittu myös monen suomalaisen museon kokoelmiin. Tukiainen on myös saanut arvostettuja palkintoja tunnustuksena työstään. Moni tuntee hänet myös ansioituneena sarjakuvataiteilijana, jolle ojennettiin Muotoilun valtionpalkinto 2007. Viime aikoina Katja Tukiaisen ihanan värikylläiset, hehkeissä väreissä hohtavat maalaukset ovat nousseet monen suosikiksi. Hänen teostensa värit tuovat sateenkaaren talven harmauteenkin. Tukiaisen sulavasti liikkuva sivellin saa pinkit, vaaleanvihreät, keltaiset ja oranssit värit tanssimaan teoksissa rytmikkäästi keskenään muiden värien kanssa saaden katsojan hyvälle tuulelle. Värien keskellä seikkailevat usein bambi-silmäiset, isopäiset, nukkemaiset lapsihahmot, joiden kasvoissa näkyy kirjoittajan mielestä jopa häivähdys taiteilijan omia kasvoja ruskeine bambin silmineen. Vankan koulutuksen itselleen hankkineesta Tukiaisesta herää halu sanoa, että hän on synnynnäinen taiteilija, tai ainakin hän kasvamisensa taiteilijaksi alkoi jo nuorella iällä. Kynät, paperit, sakset ja liima ovat kuuluneet jo lapsena hänen maailmaansa samoin kuin nallet, nuket ja kaikenlaiset hassut lelut. Jo lapsuudessaan Tukiainen sai ensi kosketuksen taideaarteiden mykistävään maailmaan matkustellessaan vanhempiensa kanssa kesälomatakoilla Italiassa. Hän muistaa ihailleensa jo kuusivuotiaana Vatikaanin ja Firenzen taideaarteita, jotka tekivät pieneen tyttöön lähtemättömän vaikutuksen. Tukiaisen taiteen lähdeaineena ei ole vain hänen oma elämänsä; hän kulkee silmät auki ja ahmii vaikutteita, elämyksiä ja visuaalisia virikkeitä matkoiltaan ja arkiympäristöstään. Hänen innoittajinaan toimivat kaikki mahdolliset visuaaliset virikkeet uutiskuvista kiiltokuviin sisältäen myös omat piirustukset, luonnostelut ja perhealbumit. Monet matkat Intiaan ovat innoittaneet erityisesti värien rohkeassa ja yllättävässä käytössä, joka onkin tunnusomaista taiteilijan maalauksille. Tukiaisen teoksissa väreillä kuvataan usein myös asennetta. Väri ei ole pelkkä väri, vaan sillä on tavallaan myös henki. Tukiainen pitää eräänä taiteensa päämääränä kauneuden ja ilon kuvaamista tiedostaen kuitenkin kaiken pahuuden ja rumuuden, joka meitä ympäröi. Teosten kuvakieli on lähikuvaa hyödyntävää, lystikästä ja epätodellista hahmojen ollessa samanaikaisesti sekä vieraita että turvallisen tuttuja. Teosten aiheet ovat irrallaan arkielämästä, ne ovat kuin satua, jossa paikka ja aika on määrittelemätön käsite. Teokset ovat kuin pakoa maailman kovuudesta keinotekoiseen paratiisiin värikkäine lintuineen, joita on usein taiteessa kuvattu henkisyyden allegorioina. Tukiaisen taiteessa voi havaita japanilaisen Manga-sarjakuvataiteen ja klassisen japanilaisen maalaustaiteen heijastumia, sekä myös renessanssitaiteelle ominaista värien vuorovaikutusta ja sommittelun harmonisuutta, jotka puolestaan johtavat taiteen klassiselle länsimaiselle raiteelle. Teoksissa voi havaita myös erityisesti Henri Matissen maalaustapaan liittyviä fauvistisia piirteitä, kuten vahvat ääriviivat, suuret väripinnat, voimakkaat värit ja teosten kaksiulotteisuuden, jotka yhdistyvät ornamentiikkaan ja koristeellisuuteen. Teosten suloiset lapsihahmot herättävät suojeluvaiston. Niitä voisi pitää myös henkisen tilan herkkänä kuvana. Teosten kaksiulotteinen, pelkistetty kuvakieli haastaa standardisoidun kauneuskäsitteen esitystavan radikaalilla, mutta tyylitellyllä koristeellisuudella. Tukiaisen kaksiulotteiset kuvapinnat vastaavat hyvin myös sarjakuvista vaikutteensa saneen kuvaruutusukupolven vastaanottomekanismeja. Taiteilija julistautuu ehdottomaksi väkivallattomuuden kannattajaksi, mutta ei myöskään voi katsoa sivusta, jos joku joutuu väkivallan kohteeksi. Hän on aina valmis puolustamaan heikompiaan, kuten lapsia ja eläimiä, joita hän usein teoksissaan kuvaakin. Tukiainen pitää itseään julmana kriitikkona itse itselleen. Hän pohtii asioita teostensa kautta. Teosten henkinen ulottuvuus välittyy tarkkaan katsovalle teosten näennäisen lapsenomaisuuden ja väriloiston takaa, vaikka hän ei teoksissaan varsinaisesti otakaan kovaäänistä poliittista kantaa. Poliittisuus on Tukiaisen töissä henkilökohtaisemmalla tasolla; uskalluksessa olla kiltti olematta tyhmä sekä kuvaamalla kauneutta kuvaamatta kuitenkaan pinnallisuutta. Teosten pehmeät arvot viestivät myös kriittisestä vuoropuhelusta yhteiskunnan kanssa. Kulunut vuosi on tuonut Tukiaisen tuotantoon naamiot, esiriput ja verhot, joiden olemassa olon voisi helposti mieltää edellisen pohdinnan luontevaksi jatkeeksi. Tukiainen on alkanut miettiä myös aiempaa tarkemmin katsojan paikkaa, joka on erittäin tärkeä katsojan ja teoksen kohtaamisen ja dialogin kannalta. Teosten kertomusten laatimisen ja niiden unenomaisen logiikan jäsentämisen taitelija jättää katsojan tehtäväksi. Tukiainen kuitenkin toteaa, että hänen teoksissaan ei ole olemassa oikeaa eikä väärää tulkintaa, vaan jokainen voi löytää verhon tai naamion takaa onnellisen alun tai lopun, hetken hurman tai vaikka oman itsensä, jonka uskoi jo kadottaneensa elämän naamioleikeissä.